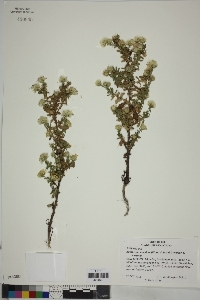 Xanthisma viscidum (Wooton & Standl.) D.R.Morgan & R.L.Hartm. Annuals, 25-60 cm; taproots 2-8+ cm. Stems 1, branched, moderately stout to stout, not wiry, stipitate-glandular. Leaves: basal usually withering by flowering; cauline evenly spaced, obovate to oblanceolate or oblong, 5-30 × 2-15 mm, markedly reduced distally, margins coarsely serrate to dentate, teeth 4-7 per side, entire, faces densely stipitate-glandular. Peduncles densely stipitate-glandular, usually ebracteate. Involucres hemispheric, 8-10 × 13-18 mm. Phyllaries in 5-7 series, linear, 2-7 mm, apices narrowly obtuse to acuminate, faces stipitate-glandular. Ray florets 14-18; corollas yellow, tubes 3-3.5 mm, laminae 2.8-3.5 × 1.5-2 mm. Disc florets 20-30+; corollas 5.5-6 mm. Cypselae oblong to narrowly ellipsoid, 2.3-2.7 mm, 18-22-nerved, sparsely whitish-silky; pappi tawny, 5-6 mm, mostly equal. 2n = 8. Flowering summer-fall. Sandy soils on flats, roadsides; 1000-1700 m; N.Mex., Tex.